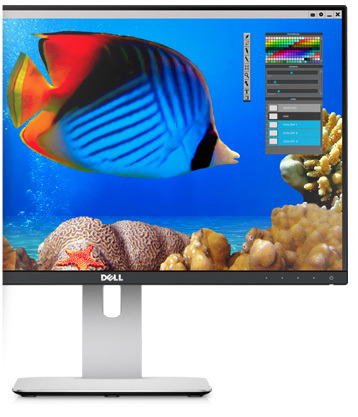 The boss presented me with a new requirement this week – he wanted a new PC to work from home with, but it had to be cheap, it had to live on his dining table (which meant no tower+monitor+cabling clutter) and he would need it to be easy put out of the way in moments with no hassle. A notebook with a big enough screen for his 65-year-old eyes would be too expensive, and the selection of all-in-one PCs from HP, whilst good in variety, was too expensive also. What to do, what to do? Surprisingly, this turned out to be easy and cheap, and only involved a leeetle bit of kludging with double-sided tape – read on to see how. Previous visitors may have come across the Benton MiniPC review I did a while ago – click here if you haven’t seen it yet. 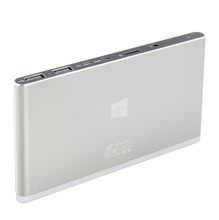 The Benton is a phone-sized slab of Quad-Core PC with 2Gb RAM, HDMI display, Card reader, Wifi, Bluetooth, and 30Gb storage running Windows 8.1. 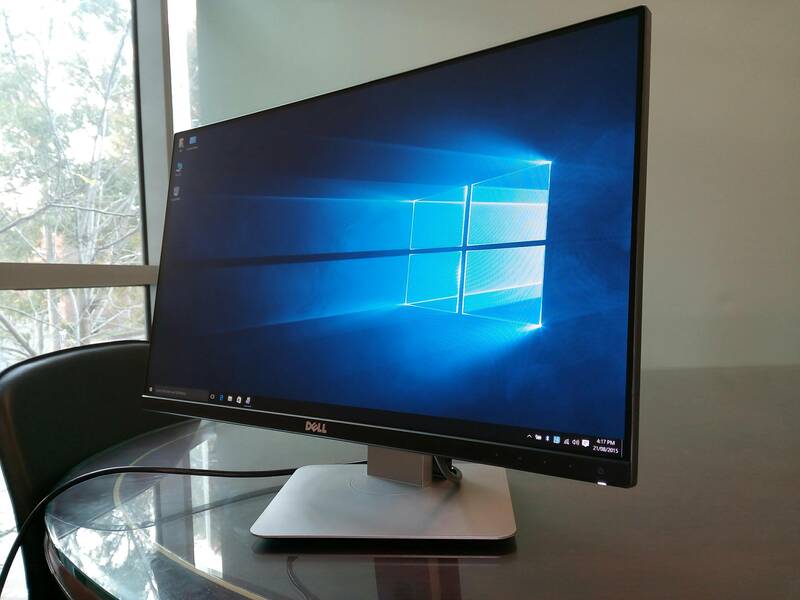 It’s certainly small enough to hide behind a monitor, lacking only in some way to attach it, and being powered by USB means it might be possible to power it from the monitor itself. 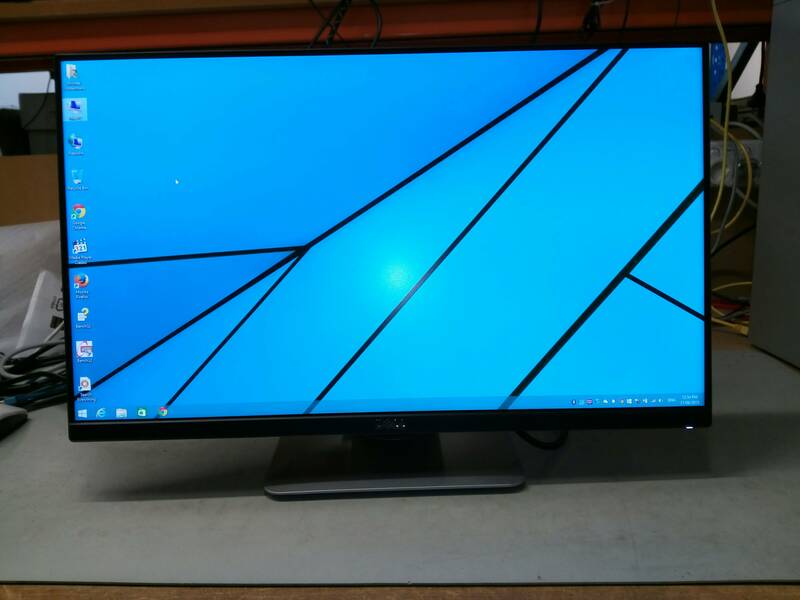 A little research turned up the Dell U2414H, a 24-inch 1080P display which had 4x USB ports, and a decent metal stand that could easily disguise the Benton. It’s HDMI input is compatible with the Benton’s output, and it’s USB3.0 port claims to support high-power charging, which should be ideal. The tape I grabbed from Bunnings was “Perma Products Mounting Tape – Exterior”, as this looked like being a permanent solution. I’ve found in the past that regular hobby/craft-grade tape tends to lose grip when it gets warm, so this stuff, being intended for outdoor use, should hopefully be resistant to fade. The Dell’s stand is high-grade smooth metal, and only just a bit narrower than the Benton, so a couple of dabs of tape secured it nicely to the rear. You could stick it higher up the stand if you wanted, there’s plenty of room. 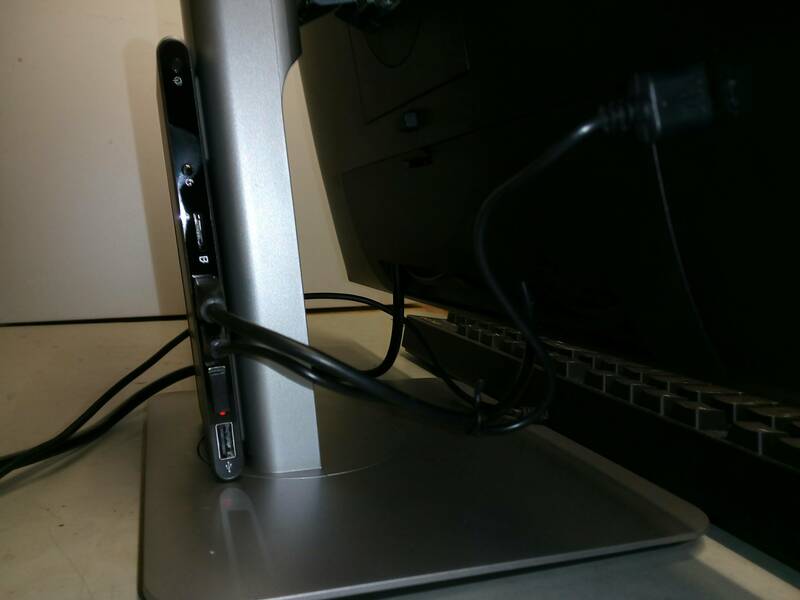 The cable sticking out the back of the Dell is the USB Male-A to MicroUSB cable that powers the Benton. 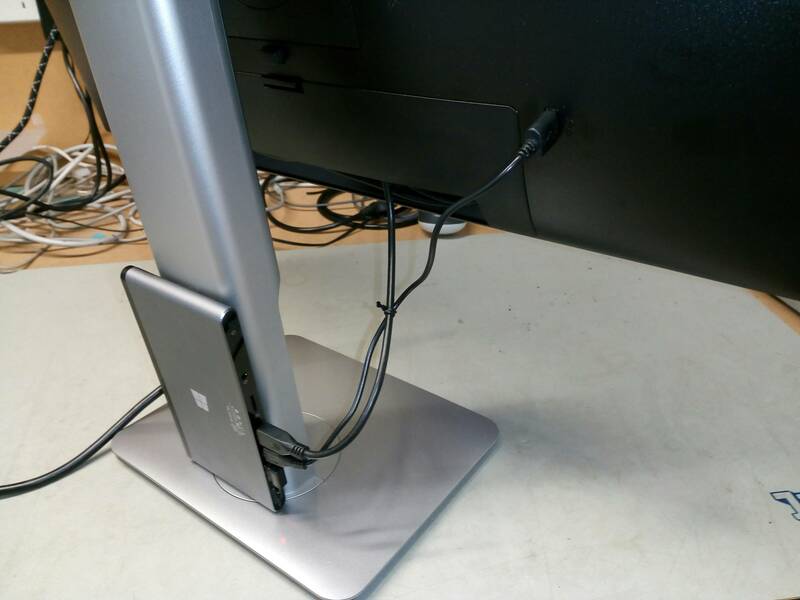 Tied to it is the HDMI display cable. There’s a removable cover for the cable sockets which lends itself to concealing the excess cable wiring quite well. The Benton MiniPC has 2x USB ports at the bottom, of which one is currently occupied by a Riitek Wireless Keyboard/mouse dongle – you could do away with that if you picked a Bluetooth device such as the Filco Convertible Mechanical Keyboard, leaving both ports free. The Dell has a 3-port USB hub that’s inconveniently buried under the cover alongside the HDMI sockets – you could use that hub with the Benton if you needed more ports, though. 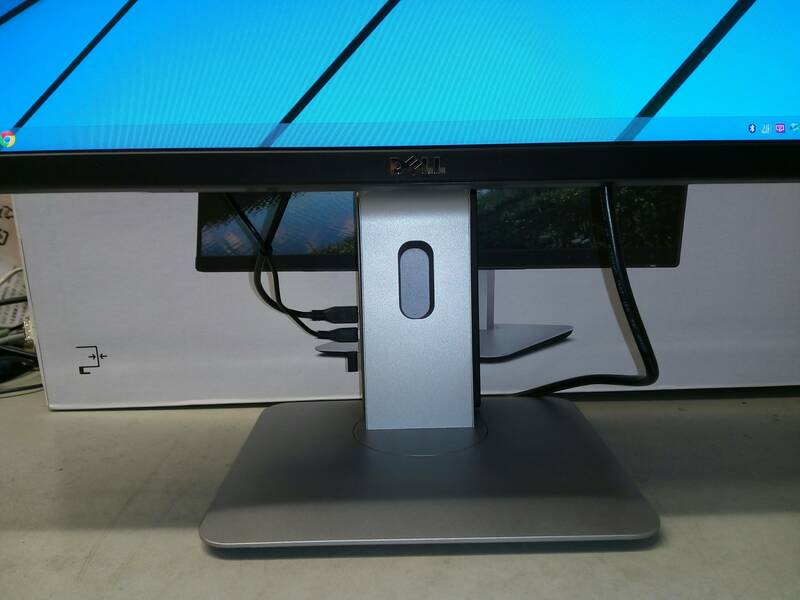 Here’s a view from the front with the monitor stand extended to it’s maximum height. You can just see the USB power and display cables on the left, and the single monitor power cable on the right. 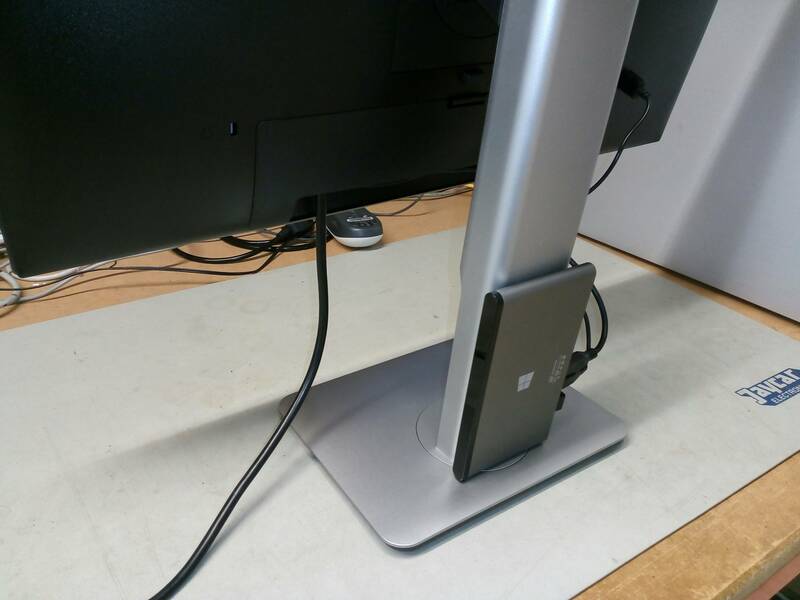 The stand has a base that swivels, and if you stick the PC to the stand a fraction above the base, it won’t interfere with the swivel. Only one power cable runs to the monitor, and since the PC uses Wifi for the network, that’s all it’ll need. When the boss needs to put this guy away, he just unplugs the monitor power cable and grabs the monitor by the stand at the back. The Benton PC is $226 delivered – the U2414H is $376 delivered to Sydney Metro – the tape was less than $6 – the cables were all included, so total cost around $600 plus whatever keyboard/mouse takes your fancy – see the configurator at AusPC if you want to spec one out. I couldn’t find any bigger-than-23inch HP/Lenovo etc All-in-one PCs for under $1,000, and most of them were over $1,500, so this works out pretty well, value-wise. About the only downside for the monitor is that there’s no speakers included, so if you want audio, you’ll need to buy speakers or a set of headphones to go with it. The Benton has a 3.5mm audio jack, and you could also use a Bluetooth speaker with it easily enough. This entry was posted on August 21, 2015, 2:04 pm and is filed under Mini PCs. You can follow any responses to this entry through RSS 2.0. You can leave a response, or trackback from your own site.